Centralbankerna inget att lita på | Vad händer i Mellanöstern idag? Numerous people reported last year that the Yen/Dollar (JPY/USD) pair and gold were moving in a direct synchronous relationship. If one rose or fell, so did the other. I made some comments regarding the relationship on December 12, 2014 in Is Gold Tracking Movements in the Yen, Euro, Anything? Gold did track the JPY/USD pair since 2012, but that trend appears over.Perhaps it starts again, perhaps not. 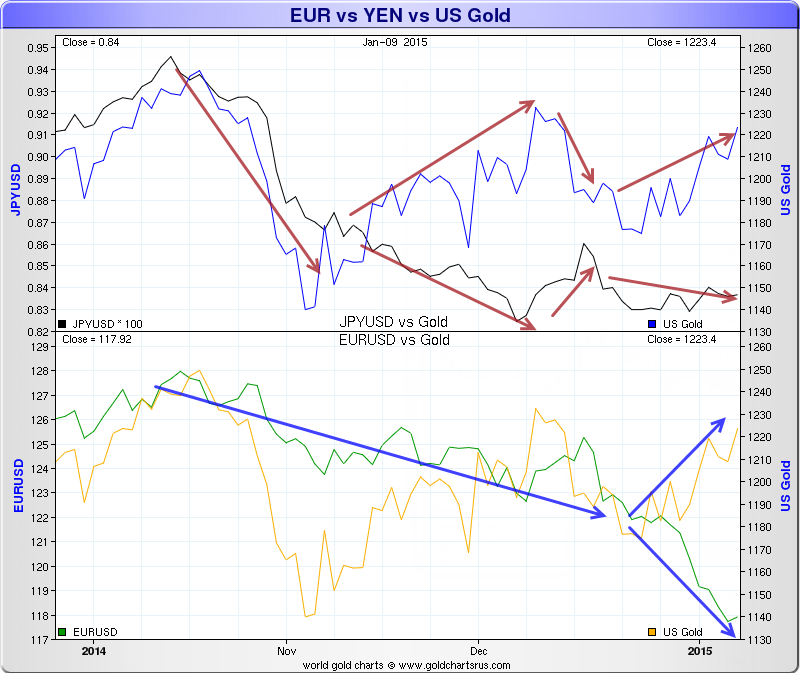 Starting early November, gold has been inversely correlated to the JPY/USD pair. 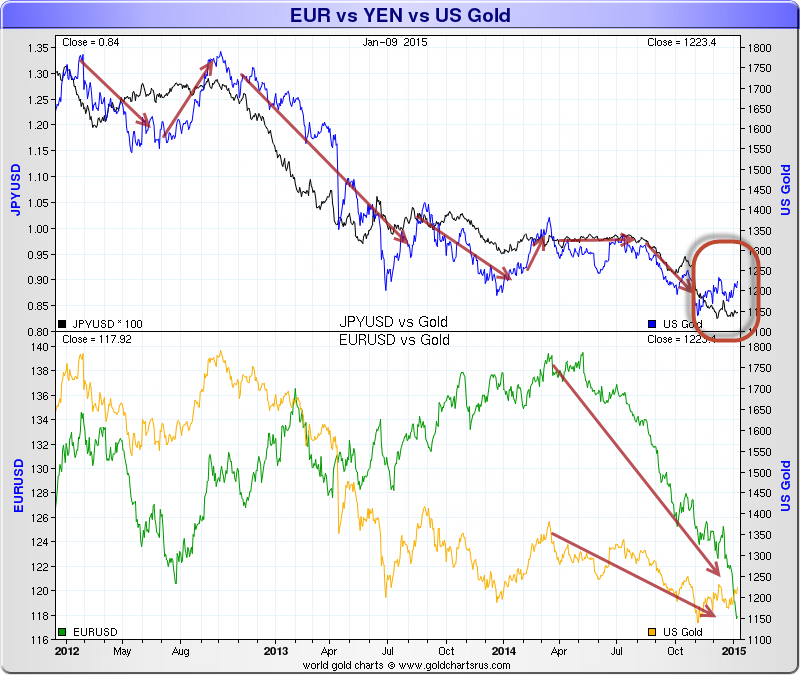 Similarly, gold had been correlated to the euro but that changed to an inverse relationship in late December. I specifically asked Nick for a chart starting October of 2014 to show the trend break that I knew had taken place. Although I commented in December I saw no fundamental reason for the relationship, that does not mean there wasn’t one. Gold generally does very poorly in disinflation (falling rates of inflation), and that’s when other asset classes perform best. The period from 1980 to 2000 is a perfect example. In contrast, gold has historically done well in deflation, stagflation, and rising credit risk in the senior currency (in this case, the US dollar). The great depression is a perfect example. Belief in central banks’ ability to control things forever is finally coming into question, as well it should. Gold does well when the soundness of the global financial system comes into question. All of the above may be true. Sure Trades: Reflections on the ”Sure Trade” of 2014; Yield Curve Inversion Possible? Five ”Sure Things” for 2015? Don’t borrow money in other currencies, especially long-term mortgages. Don’t expect currency interventions to work forever. Don’t believe statements made by central bankers. They are not the economic wizards they are made out to be, and they often lie when it suits their purpose. Number 3 is the most important one. For further discussion of point 3, please see Grand Experiment Failure; Bankers Prefer Bubbles; Europe is not USA; Final Epitaph.